Read Shannon’s full story and 12 others about finding healing and hope after loss of a sibling. If I had to describe Kevin with one word, it would be dedicated. And I would use that word in many different ways. He was dedicated to his job, and his future. Kevin did have a tough time finding his passion and what he wanted to do with his life for a couple of years. However, when he found it, he was unstoppable. Kevin’s passion for music was indescribable. He was constantly working on it, talking about it, and promoting it. He was so determined to make a future out of it that he would do anything to get there. He even dedicated an entire summer to doing chores and yardwork for our grandmother to make the money to buy his own keyboard. While working on his music, Kevin had a job as a busboy. To most, this would be a low-end lame job some see as shameful or not really something to talk about. Not Kevin. He talked about that place as if he worked for the president of the United States. He loved his job—I’m not sure the word love is even a strong enough to describe it. He was always so excited to go to work, bus tables, make friends, and get to know the customers. I fondly remember him “complaining” that he had to go to work, but he always had his signature smirk when getting ready to leave. We never found out what was so special about that restaurant, but seeing him happy with something so simple was all that mattered. He was so easily excitable and driven, and they were two of my favorite characteristics about him. Kevin was also very dedicated to his family and his friends. I know it is pretty typical for someone to say that his or her loved one who passed was the best person there was, and in my case I say it with confidence. Kevin was so loving, so understanding, and so patient. He wasn’t perfect, but he was as close as it gets. There were many people who wouldn’t be given a second glance by most, but he never gave up on them. A lot of people gave up on me, but Kevin never left my side. I am forever grateful to him. Kevin spent two years studying at Florida State University in Tallahassee (pursuing a music degree, of course). He loved the school, the Seminoles, the city, the atmosphere. If it was related to FSU, he was all about it. He spent one year as president of Epsilon Sigma Alpha, which is a co-ed service fraternity. He was constantly attending and running community service events, raising money, supporting the homeless, and doing all kinds of incredible things that the average person would never do. When we were younger, I was Kevin’s “protector.” Though I was sixteen months younger, I took the older sister role. He was very shy, sensitive, and quiet. My parents even had Kevin tested for autism, but doctors weren’t able to diagnose him with it. I was always so worried about him, even while we were in college together. However, as soon as he left high school he grew into his own and became a confident, strong man who I hadn’t known before. His successes were incredible in the short time he was at FSU, and he worked so incredibly hard towards his dreams. Unfortunately, Kevin didn’t get into the music program at FSU for reasons we’ll never know. We all knew how heartbroken he was, but again he made something great out of it. He moved home to southern Florida and moved in with our brother, Jeffrey. This is when he began working as a busboy, and really started focusing on his music. While most people would have given up on their passion after that kind of rejection, Kevin used it to fuel himself to work even harder. Every single day he worked on his music, made money on the side, and had that big grin on his face no matter what life threw at him. On the weekend of September 6, 2015, Kevin and a few friends traveled up to Florida State to spend Labor Day weekend with friends. He was so excited to see everyone again, to attend a football game, and to have fun in his favorite city. That Sunday night, Kevin and his three friends, Morgan, Vincenzo, and Niko, left the friend’s apartment to go get food. What they didn’t know was that someone they never met made the selfish, disgusting decision to get behind the wheel of a car after drinking too much. I was at my new apartment in Gainesville with friends. I had just been on the phone with my mom and we hung up. She called back not even five minutes later, and I will never forget her words. My roommates drove me the two hours to Tallahassee. During the drive I kept frantically calling my mom, my dad, my brother, hoping for answers. I texted Kevin, telling him I would be there soon. I had plans to buy him his favorite candy and a stupid little teddy bear, thinking he would be hospitalized for a while. He never made it to the hospital. I should’ve known then by the look on the police officer’s face. His look was filled with nothing but guilt and heartbreak. I refused to believe it. I thought to myself, okay, he’s probably unconscious and injured. I need to prepare myself to see him hooked up to machines. Instead, I was taken to one of those family counseling rooms, the kind nobody wants to go into. You know the ones—you see it in the movies when someone dies. But my brother wasn’t dead. Why is he bringing me in here? I was greeted by some random woman, and my mother. She looked lifeless. My mother, who was always so happy to see me with sunshine pouring out of her eyes, wasn’t there. She sat me down and shut the door. I still didn’t want to believe what was coming. Were they my screams? My mom’s? My face was soaking wet. My tears combined with those from my mother—a mother who had just lost her child. It wasn’t just my brother and friends who died that day. My life ended too. At 9:15 p.m. on Sunday, September 6, 2015, Kevin and his two friends, Vincenzo and Morgan, were all killed by a drunk driver. And that is when our world stopped. Written by Shannon Boos. 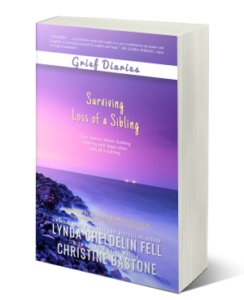 Excerpt from Grief Diaries: Surviving Loss of a Sibling. Shannon’s 21-year-old brother Kevin was killed by two drunk drivers in 2015.